- The Rottweiler - Also known as the butchers dog or Rottweil Metzgerhund is a dog breed that is part of the working dogs group and therefore is happier when there's a job to be done. These dogs were brought into Germany when the Roman Empire Invaded Europe, they where specially and selectively bred for the purpose of these traits which consisted in guarding and herding livestock. Butchers in the Middle Ages also used them for pulling carts and other heavy duties. When these Mastiff-Type dogs were brought into Rottweil in Germany where the Roman Settlement was they became very important and popular, in-time "Rotties" due to there natural guarding instincts gained popularity and were used by the Police and Military Forces world wide, this dog breed has a long history dating back to the Roman ages, these dogs are powerful, compact, well proportioned, smart and self-assured and unfortunately some miss-behaving or aggressive dogs are due to irresponsible owners, lack of socialization, abuse or neglect that caused them to recently have gained a negative association in the media and therefore requires careful handling from puppy-hood to fully grown adult dogs. This breed isn't for the faint hearted, proper handling and training are essential requirements for the ownership of such a strong, active and formidable animal other than this they are affectionate, loyal to there Masters and always eager to please although they are very wary of strangers, but if properly introduced they go along with anyone. 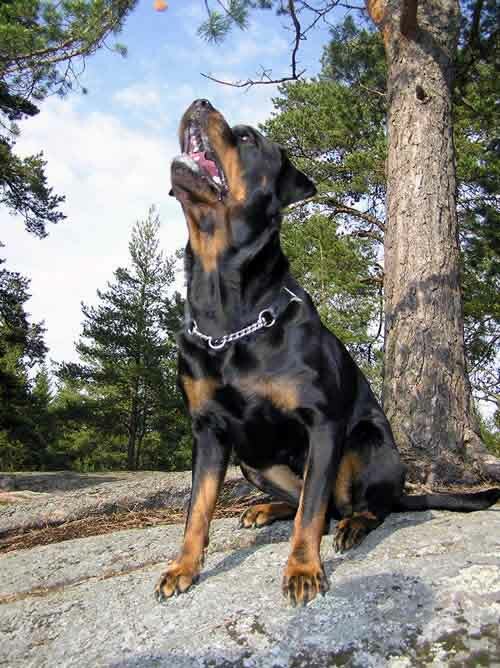 - Click here to know even more about the Rottweiler Dog Breed.